Snow has always been a challenge to model because scale snow must be fine enough to look ”in scale,” yet have a little sparkle to it, and still look cold and fragile. Materials used in the past all had their drawbacks, Sugar attracts bugs, Baking soda yellows quickly, Flour does both Glitter usually looks way over scale and imparts a Christmas-like or tin-like look to the scene being modeled. 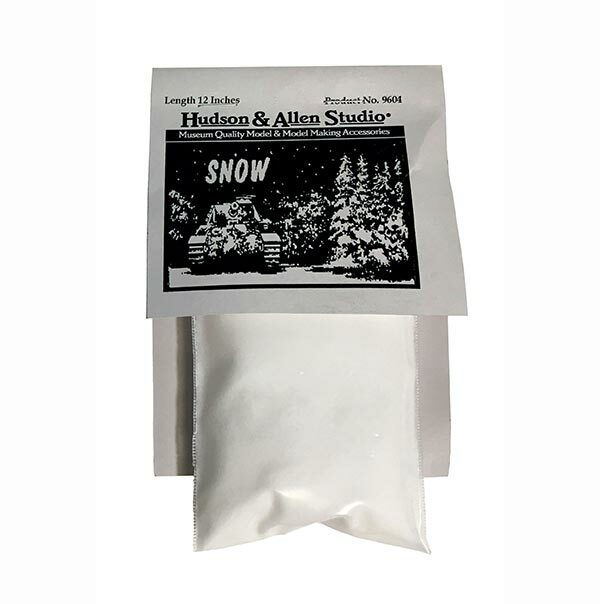 Hudson & Allen Studio SNOW is a blend of inorganic materials which will not attract bugs (at least any we’ve ever been able to find). Will not yellow, and will give you realistic looking snow for your diorama. It is easy to use right out of the bag and requires no painting. Simply mix with water to a paste like consistency, and spread onto your dioraima to form flows and drifts. Allow to thoroughly dry. Stand back and graciously receive your well deserved praise. If you wish to model a dusting of snow, use this product dry. First, wet the area to receive the snow with diluted white glue or a dusting of clear laquer. While the model is still wet, sift a light coat of Hudson & Allen SNOW onto the model and allow it to dry. Blow off any unadhered SNOW and touch up any uncovered areas that may base been missed.